Since the plot of this film is fairly mysterious, and half the fun of the movie is watching the mystery unfold, I'll try to keep the summary of the plot vague and brief. 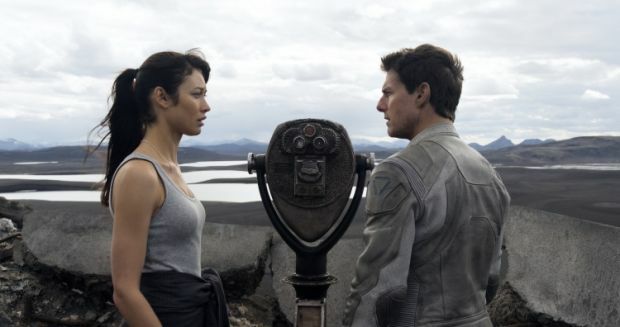 In the year 2077, Technician #49 Jack Harper (Tom Cruise) and Victoria Olsen (Andrea Riseborough) are the last two humans on Earth. 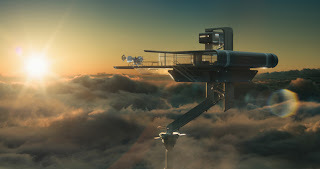 Earth was eradicated sixty years prior during a nuclear war with an alien race called the Scavengers (Scavs for short), the moon was destroyed, and now the rest of humanity resides in the Tet, a giant tetrahedral space station housing humanity until they can successfully migrate to Titan, one of the moons of Saturn. Jack and Victoria are partners (both work and sexual) and spend their days ensuring that the drones protecting the large machines extracting Earth's remaining resources are in working order. Living together in a home far above the Earth's surface, Jack leaves everyday to patrol Earth, fix drones, and work on building his secret collection of Earth artifacts in a homestead he has built on the planet. Having had their memories wiped for security reasons, Jack and Victoria's only other human contact is with Sally, the commander who relays orders to Victoria every morning. With only two weeks left until they return to the Tet, Jack seems to have mixed feelings about returning as he has developed a love for life on a planet which he never lived on. There are also the dreams: dreams of a woman and a life on Earth which he knows he never could have experienced. And then, a spaceship crashes on the ground and Jack is compelled to rescue a surviving member of the crew, who brings with her an entirely new set of questions. Jack and Victoria's home in the sky. While it may turn off some viewers, I felt that one of the strength's of the film was it's deliberately slower pacing. Watching the film, the audience is absorbed into the languorous day to day lives of Jack and Victoria. 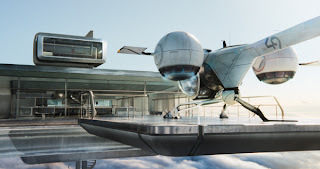 Every morning the "couple" wakes up; Jack heads out to repair drones while Victoria functions as his mission control. At the end of the day, Jack returns home to an awkward routine of intimacy. While we're told the couple only has two weeks left until they're able to return to the Tet, we really have no idea how long they've been caught up in their routine. It's fair to say that the film's pacing suits the film's theme of leading an unexamined and unquestioned life. While Jack and Victoria display some sexuality, there never appears to be any true intimacy. Orders and regulations are conveyed to them remotely by Sally, their commander aboard the Tet. While Jack has the freedom to fly around in his Bubble Ship, his world ends at the borders of the radiation zones which his flight computer dictates to him. And while being trapped in this monotonous existence, Jack dreams of a world and a woman that he does not know. The set, costume, and prop designs for the film are all extremely well done. The home far above Earth's surface which Jack and Victoria inhabit is extremely modern with design so sterile that it puts Apple to shame. It feels bleak, hollow, and empty, much like the character's lives. When we jump into Jack's Bubble Ship, however, we begin to see design that echoes of humanity and purpose. Jack's uniform and ship show hints of the wear and tear that show that his journeys to the Earth's surface are perhaps the only unique and adventurous aspects of his life. 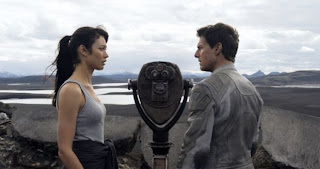 While we're prompted to believe that the Earth is barren of life and overrun by the Scavs, the audience discovers what Jack has learned on his trips there: there's more of value down in that barren yet natural wasteland than in his fabricated and sterile life far above the surface. The cinematography is excellent, as many of the scenes of Earth are breathtaking in their stark beauty. The Bubble Ship used by Jack Harper to investigate damaged drones is an amazing design. The film doesn't have a large cast, but the actors and actresses present are strong. 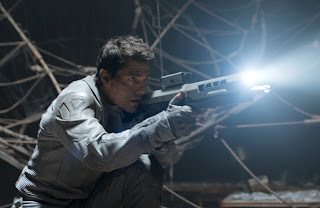 Cruise was excellent as Jack; he very much plays an everyman type character who is struggling to make sense of a world that he hasn't fully explored and of a life that he doesn't truly understand. While he must do so in the confines of a job that forces him to be professional and always on guard, Jack's natural curiosity of a world that existed before him is brought to life by Cruise. Riseborough's Victoria is a wonderfully and beautifully mysterious companion to Jack. At one moment attempting to make intimate gestures towards Jack and then the next being cold and distant, Riseborough excels at making Victoria perhaps the primary mystery of the film. Olga Kurylenko brings a familiarity to crash survivor Julia that helps the audience to understand why Jack is so willing and able to buck the reins of his life in order to aid her. Lastly, I'll mention Morgan Freeman's performance as Beech, another mysterious survivor encountered by Jack. While Morgan Freeman rarely turns in a bad performance, there just really isn't much for him to do in this role. While his character is important to the plot, Freeman's addition feels like an attempt to simply add more star power to the cast. Andrea Riseborough as Victoria at her control station. Overall, I really enjoyed Oblivion. While it has pulled inspiration from numerous classic science fiction films, and near the end begins to pull out far too many science fiction tropes, it still presents a beautiful and fairly imaginative story with an excellent soundtrack by M83. Most importantly, it's a movie that will hopefully encourage you to think about some of the ideas that it presents. While there are a few minor things that I believe could have been explained better (as they are left far too unclear in the film), I do believe that the movie answers most of it's questions, or at least those that it needed to. 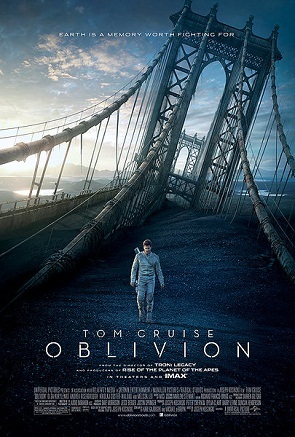 In the end, Oblivion leaves an impression because of the barren but beautiful world that it creates and because of the lonely images of Jack Harper seeking to break the chains of an unexamined and stagnant life, looking for something that he trusts and hopes is out there. All images are the property of Universal Studios and are used for the purpose of reviewing this film. Great review.  The story is stretched thin and at times simplistic, but is salvages somewhat by the performances. 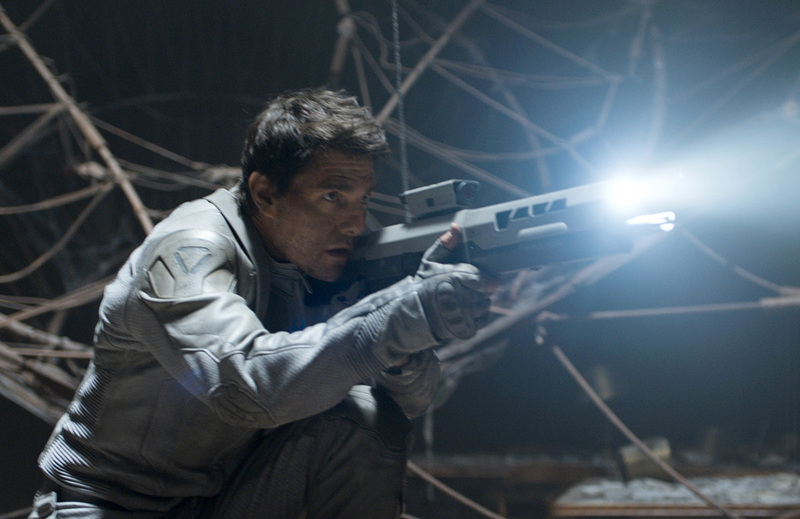 Although, I do have to say that Cruise gives this role his 100% effort to work. It does, but the rest of the movie doesn’t.